Ready Set Go are Jamie (guitar), Graham (drums), Sydney (vocals) and Noah (bass). This weekend, I biked down to my usual hangout in Santa Monica to catch some buskers performing on Third Street Promenade. Apparently, musicians sleep in late because it was almost noon and there were no singers in sight. But just when I was about to leave, I noticed a bunch of barely-there teens setting up their equipment. 3000 Miles by Ready Set Go! IPOD by Ready Set Go! Check out their YouTube channel, consisting of original songs and covers of pop hits such as Jessie J's "Price Tag" and Eminem and Rihanna's "Love The Way You Lie" which has amassed over 2 million views. 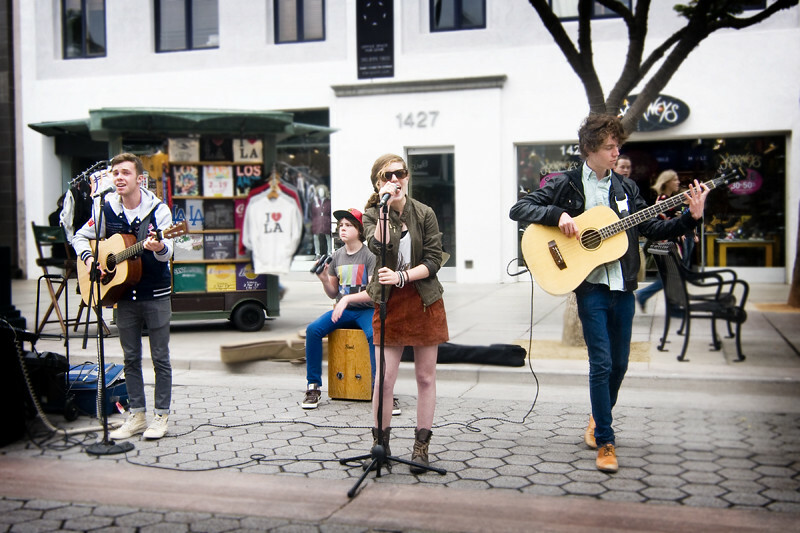 Along with playing venues all over Los Angeles, Ready Set Go has already toured the country performing on major stages such as FishFest 2010 and playing high schools across the country for the Milk Rocks tour. Currently, Ready Set Go are unsigned and are recording their official debut album. Ready Set Go covers Jessie J's "Price Tag"